While I was in the charming city of York on a three day business visit, there was no way I would go back without a trip around the beautiful Yorkshire. I had two full evenings and I already had the places to visit on list, some of the most charming sights on the North Eastern coast of Britain. It was about 5 in the evening when I set off from York and drove out of the buzzing traffic. The roads that pass through the moors are unbelievably straight and dips & raises to a very high extent. It is like a roller coaster of roads and driving through it meant another blissful evening. I was enjoying every curve, ups & downs on this stretch, panoramic views across the moors and it was then I missed the diversion that I had to take! Scarborough was towards the left and I kept going straight.One of the many things that is different driving in this country is that on most roads you can’t make an about turn until the next junction, I drove ahead to find one. Five minutes and couple of miles ahead another orange board could be seen, orange boards in the UK mean there is a tourist attraction around and I promptly read Howard Castle. Once again, getting lost had brought me to another destination! Howard Castle, the Lonely Planet says, is one of the world’s top ten greatest mansions and grand houses. 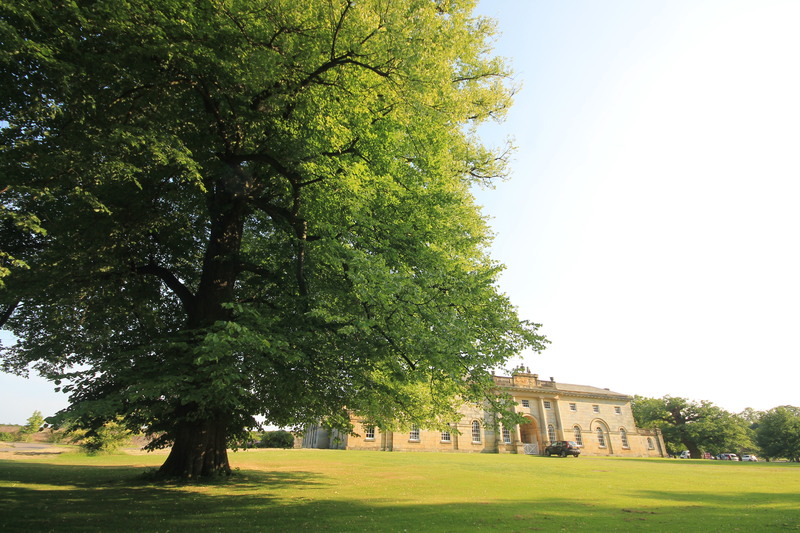 Built in Baroque style during for King George, the Howard Castle is located amidst a stunning landscape about 24kms north of York. I had ended up passing in front of this good old castle on my mistaken detour, but my luck wasn’t as good as it seemed. The castle had closed for visitors at 5pm. I had to quash my ideas of at least finding a good outside view when I saw the board at the gate written, Guarded, Do not try to enter during off time and picture of a beasty looking dog with its prangs out! The landscape outside looked absolutely stunning, I had decided, I was coming back again. Rather than wandering around and trying my luck, I decided to head ahead. After lot of calculations, I decided to go to Scarborough first and Whitby later. 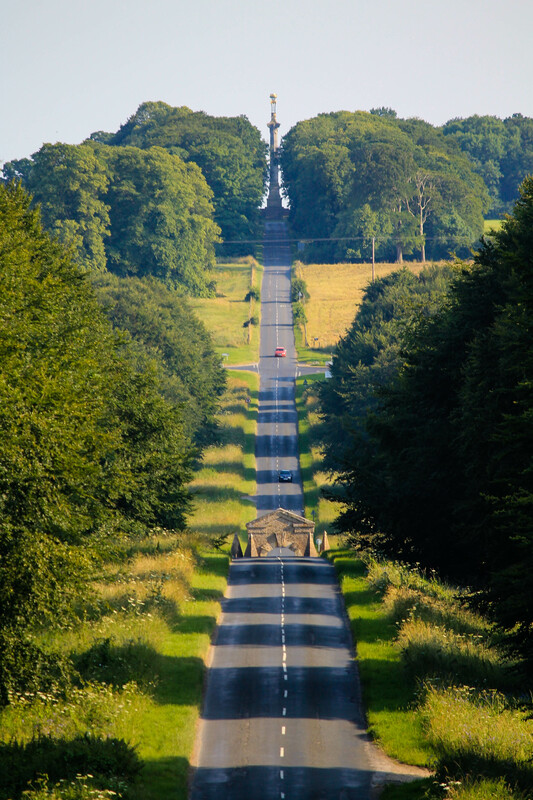 The drive from Howard to the main road that goes to Scarborough is yet again like an uncoiled roller coaster track, straight and with very high dips n raises. 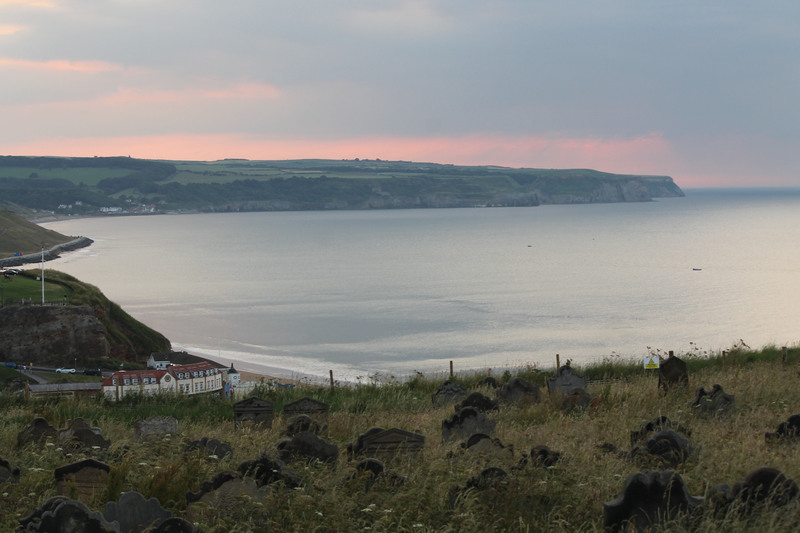 Around quarter past five, I arrived at Scarborough, a coastal town on the north eastern shores of England. My destination was the famed sea-facing castle of this town. I drove through narrow streets and ended up at the gates of the castle only to find the staff walking out and locking the main gate. Well, I wasn’t disappointed because I knew I would end up only at a closed door given the time of my visit. 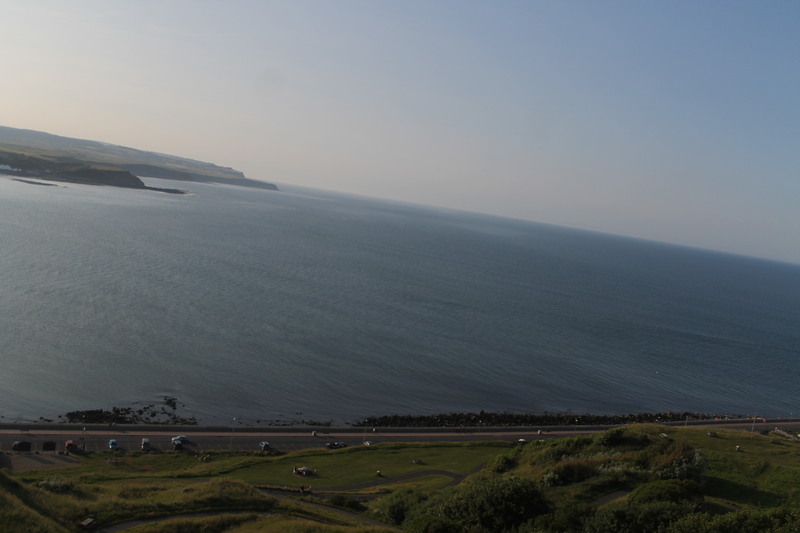 Most of the places close by 5pm during summer months and Scarborough Castle was not different. I stood reading the information board outside the main gate. History says, this sea facing cliffs have been a prominent part in the kingdoms that ruled this area from as long as 100 BC. During the Romans time, this was one of the many signal stations across the eastern coast and later became a prime point of control during the Anglo-Saxons who even built a church. Later the wooden castle got converted into the stone castle, went through many reigns under many kings, played a prime role in the hundred years war, was a major spot for the woollen trade and at last even got bombed by the German army during the World War and was demolished. What stands now is a ruin of the once magnificent strategy house and a 12th century fort. The castle’s location takes advantage of a naturally defensive site on a headland with steep cliffs, 300 feet (91 m) high, on three seaward sides. After a taking in views of the marina and the sea side buildings, I inquired a dog-walker about the alternatives to take a look at the castle since it was closed now, I had an answer. On the left side of the gate was few steps that climbed further up the hill and as I reached the top and on climbing up another mound I was facing the North sea for the first time ever!Dark shades of blue spread into the horizon, caressing the eastern shores of England. Behind me was the very structure that I came looking for, the ruins of Scarborough castle. All that the history said was true. The castle was perched up such that the views of the sea from that point would have been phenomenal. It was like the perfect vantage point for a guard to be in. I went ahead admiring the views of the sea, the castle, the shore cliffs and the road beneath, the marine drive, if you want to name it. I wasn’t disappointed even if the gates were closed, in fact I wasn’t sure if I would have paid the price and gone inside when the views outside where so glorious or may be I would have missed this view if I had gone inside the castle! Everything said, it was time for me to drive ahead. North Yorkshire has some of the most scenic farmlands that I have seen in the UK. The roads cut through the fields that were on top of a cliff and stretched out into the coast. 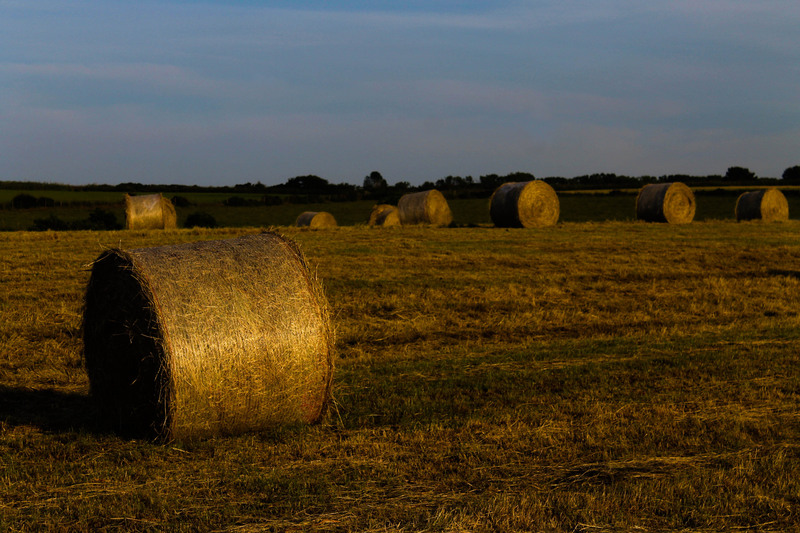 The summer sun was painting golden over the bales of hay that dotted across the farmland. 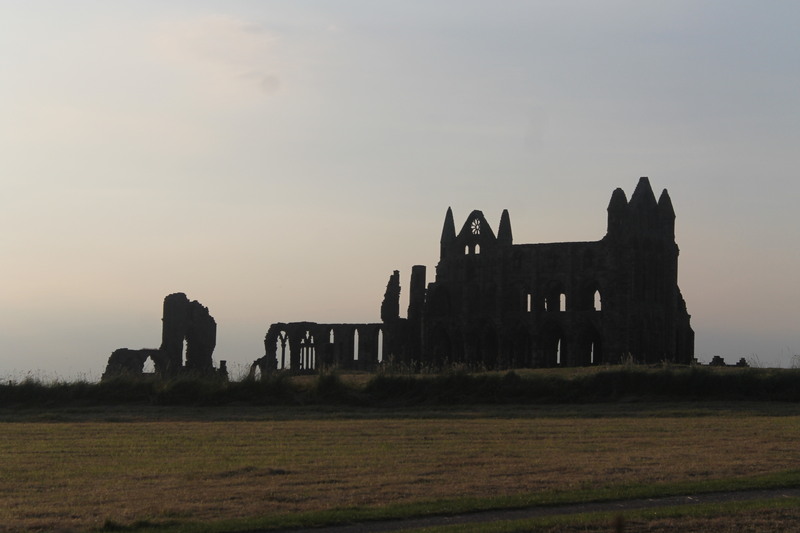 As I drove across the rolling meadows, at the far right end, I could see the structure of the abbey that I came looking for, The St. Mary’s Abbey in Whitby or more famously called the Whitby Abbey. The abbey here is believed to be existing from 657 AD when the Anglo-Saxons ruled Britain. The monasteries and the abbey were destroyed by Henry VIII during his infamous dissolution of monasteries. But the ruin is one of the list 1 protected buildings by English heritage. Overlooking the North Sea, and majestically over a cliff at a great height from the town of Whitby and its shores is this rustic ruin that mesmerizes. One can only imagine on how pompous would it have been during its hay days. The other interesting connection that Whitby has is with the famous character ‘Dracula’. 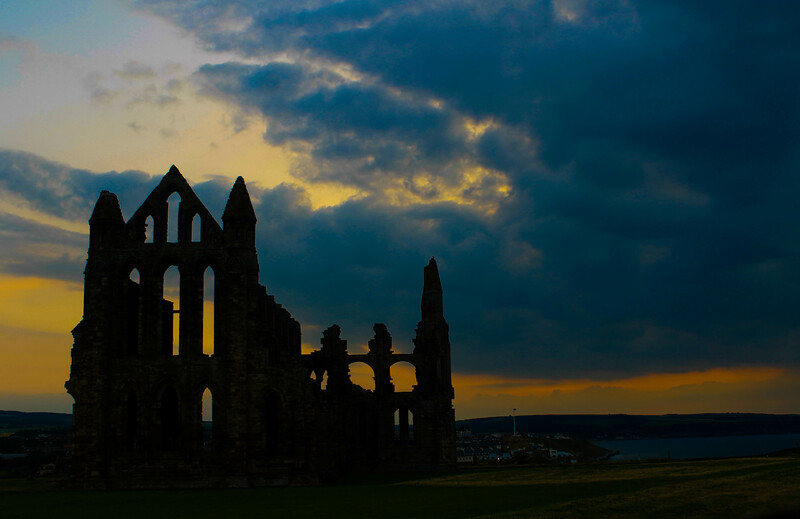 It was here in Whitby that Bram Stoker, the author, was inspired and completed most part of his famous horror novel. 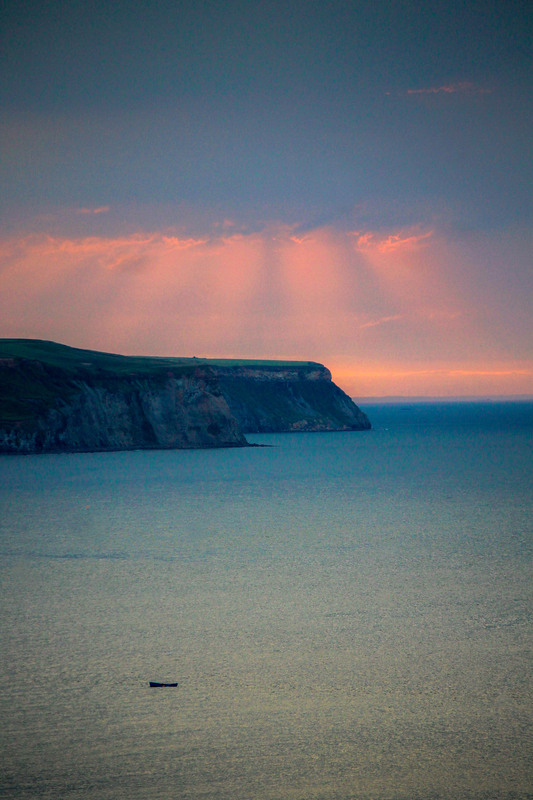 In the novel, Dracula is shipwrecked off the Yorkshire coast, he is actually on his way to London. He comes ashore in the guise of a black dog and wreaks havoc on the town. This abbey has one of the most beautiful cemeteries that I have ever seen or the best place for a cemetery to be in. 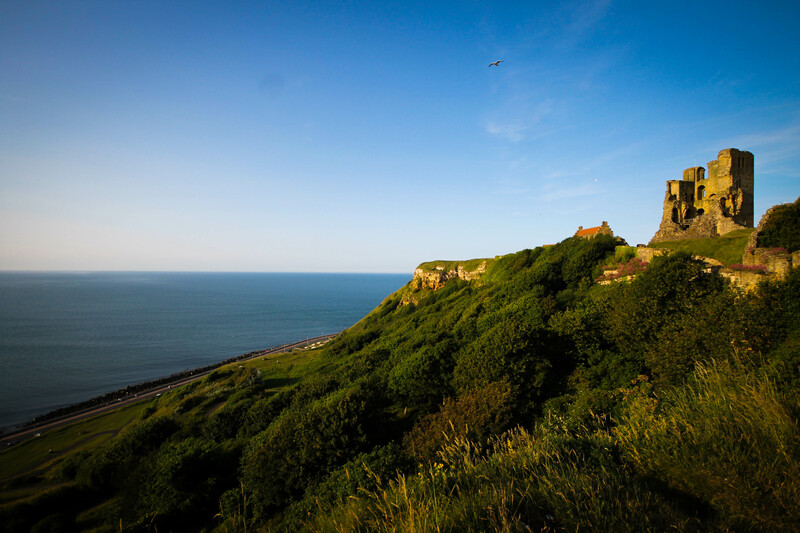 Along the slopes of the cliff that the abbey is perched upon, stretching half way into the sea below, overlooking the waters of North Sea and its beautiful sun rises & sun sets, waves and sea birds, lay a couple of hundred souls. Their tombstones look as if they are all enjoying the view from the top every day. What a place to take your final rest, isn’t it! 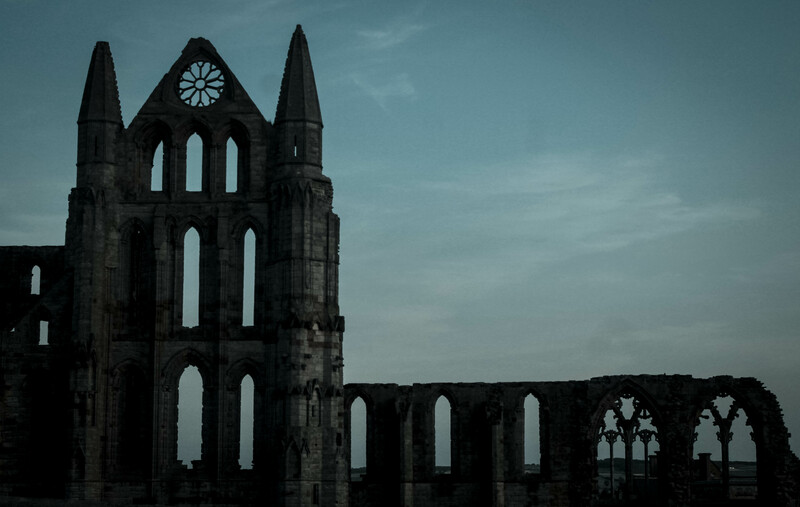 By all accounts, Bram Stoker was quite smitten with the atmosphere of the town; the red roofs, Whitby Abbey, the church with its tombstones and even the bats flying around the many churches. The decision of visiting Whitby later in the day gifted me yet another beautiful sun set and the setting made it a unique one. Standing right on top, like on a vantage point, by a century old ruin that has seen it all, watching the sun sink into the North Sea, it will be a sun set like no other.